Tackle had problems with Ovett after the loss. Everyone in this match keeps having problems with each other. Comando Elite win in their return. 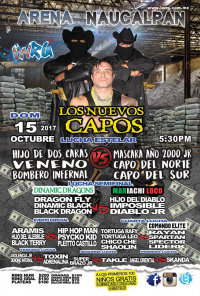 the mystery Men In Black from last week helped Mascara get the win over Veneno. Vortize replaced Heddi, worked twice. Traumas weren't happy after they lost. 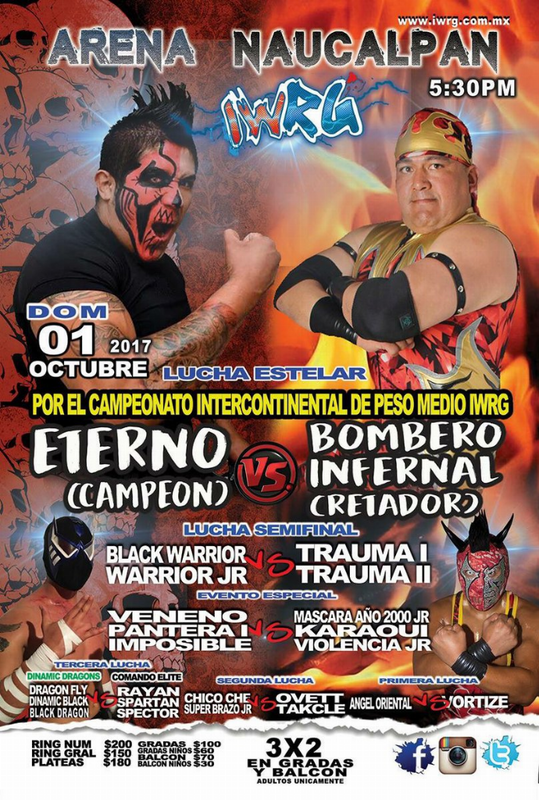 Bombero took falls 1/3. 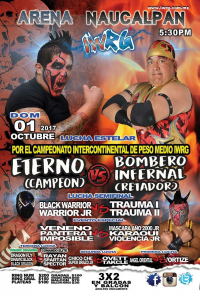 Eterno falls in his first defense, losing the title to his rival. 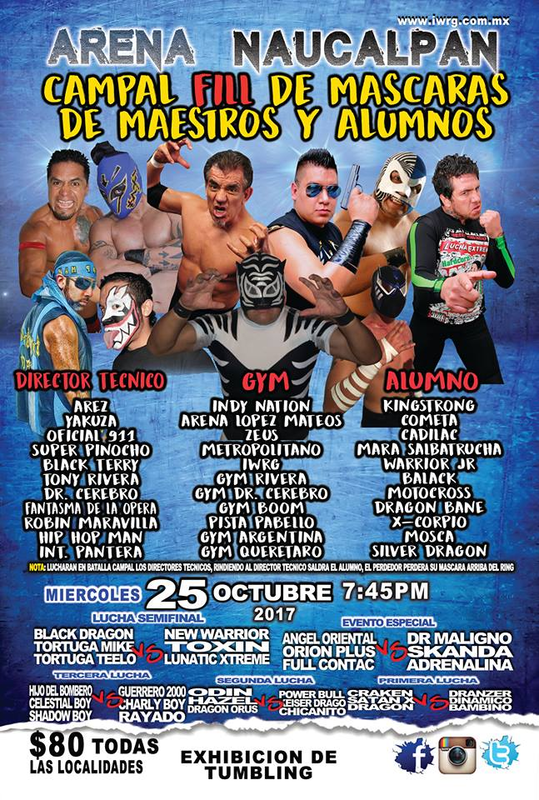 3) Aramis, Climax Jr., Shaolin DQ Harry The Sick, Taylor Wolf, Violencia Jr.
4) Rayan, Spartan, Spector b Black Terry, Bombero Infernal, Súper Brazo Jr.
911 & Ak47 replaced Leo & Mike, and (with Fierro) attacked the turtles blaming them loss. 6) Hijo De Dos Caras, Máscara Año 2000 Jr., Veneno DQ Black Warrior, Pirata Morgan, Warrior Jr.
everyone attacked Mascara 2000 Jr. His two mystery men made the save, and are billed as the new Capos. big Plieto Castillo replaced Oficial 911. 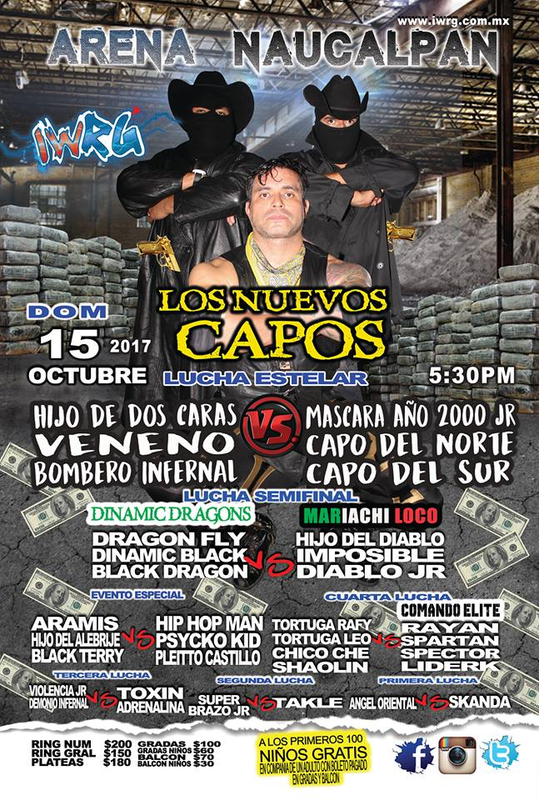 Hip Hop Man & La Mosca interfered to help him win in straight falls (he's the new third person in their trio, and they're back in IWRG.) Hip Hop Man wants the Argentina title back from Dragon Fly. great match. 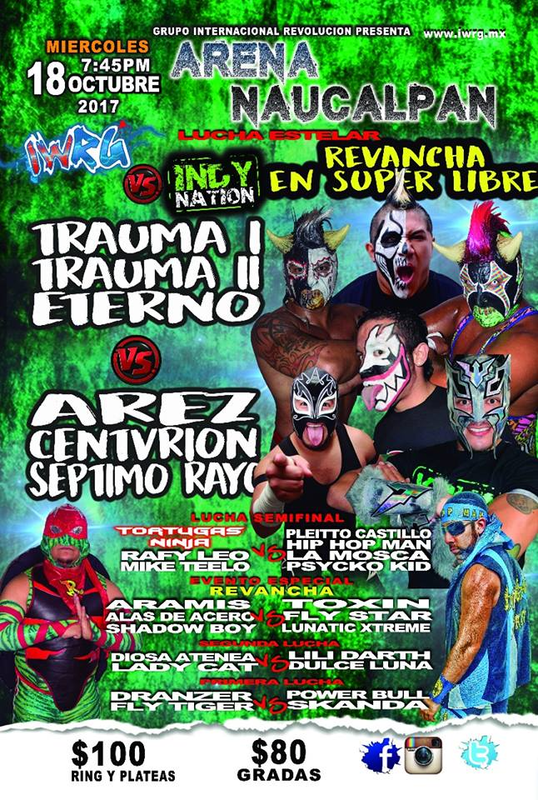 Arez challenged Trauma II to a singles match. Straight falls. Castillo hit the referee, causing the DQ. 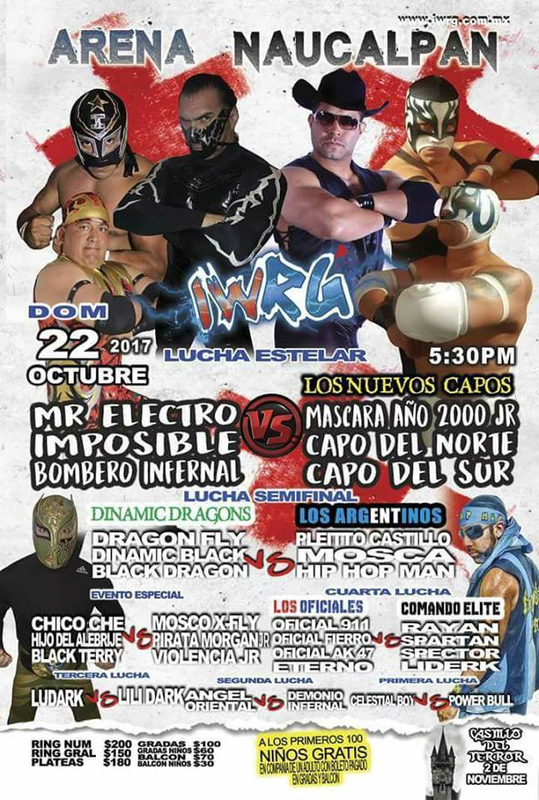 Mascara Ano 2000 Jr. gave Dos two martinetes, unseen by the referee. Event Notes: Show advertised, then canceled at least a day before hand. Ludark's first match here since 2012! Comando Elite continue their run of success. 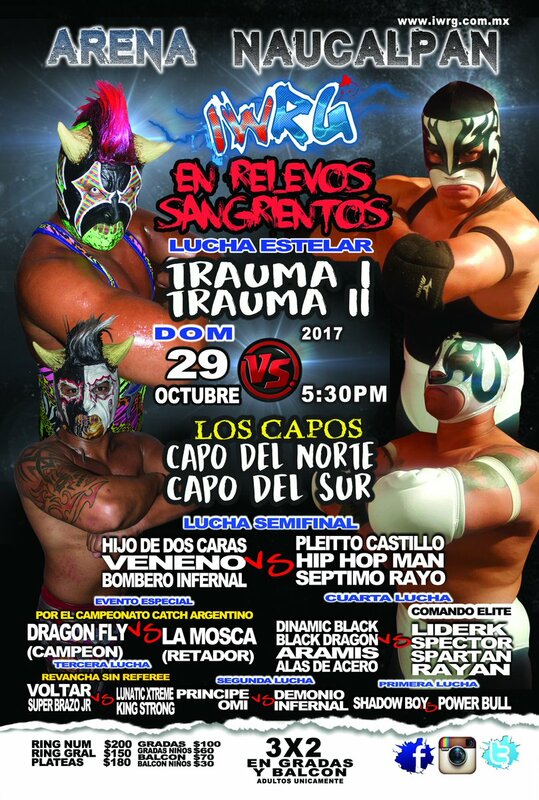 Oficials clamied the Comando Elite cheated and challenged them to a mask vs hair match. Demonio Infernal replaced Pirata Morgan. 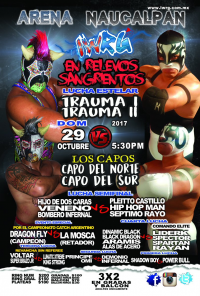 Hip Hop Man will get his title match with Black Dragon next week. Hip Hop Man & Pleito distracted Electro and attacked him after the match. Rules of the match were each maestro started the match, then would be replaced by their student when they escaped the match. The last student left would lose their mask or hair. 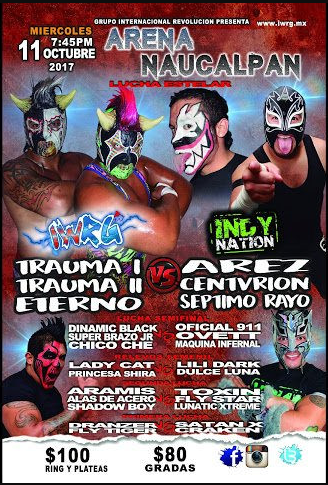 Teams were Indy Nation (Arez & King Strong), Arena Lopez Mateos (Yakuza & Cometa), Gym Zeus (Oficial 911 & Cadilac), Gym Metropolitano (Super Pinocho & Mara Salvatrucha), Gym FILL (Black Terry & Warrior Jr.), Gym Cerbero (Dr. Cerbero & Motocross), Grm Rivera (Guerrero Mxitico & Balack), Gym LLBoom (Fatnasma de la Opera & Dragon Bane), Gym Pista Pebellon (Robin Marvilla & X-Corpio) & Gym Argentina (Hip Hop Man & La Mosca) and Gym Queretaro (Internacional Pantera, Silver Dragon). 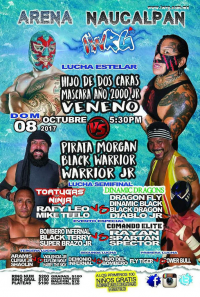 Match ended with Warrior Jr. defeating King Strong, who was announced as Hugo Sanchez, 19, from Mexico City. 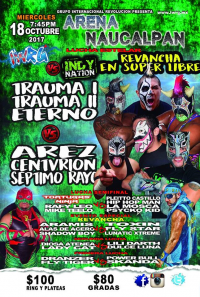 Arez, upset about Indy Nation losing, challenged Lunatic Extreme to a hair match. Spartan & Black Dragon are feuding.